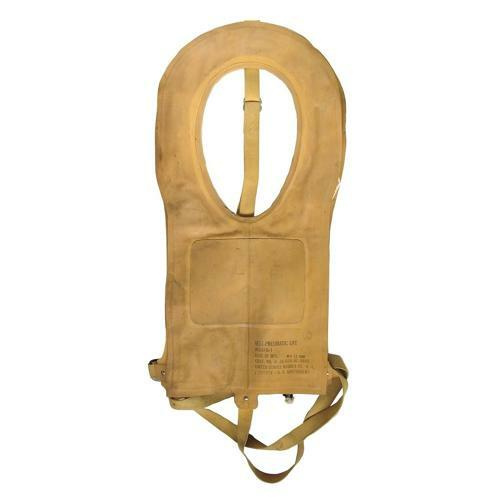 Vest, Pneumatic Life, Type AN6519-1. By United States Rubber Co. Ltd. Date of manufacture, May 11 1945. The material is in excellent flexible condition and really quite clean bar minor marks and some stencilling. The 'sides' retain much deeper colour and the dye marker pack remains in place. The vest retains its securing straps, all of which are in very good condition. Also has both CO2 bottle holders complete with screw-on covers and pull-strings. The inflation tubes/valves are present and in very good overall condition complete with bungs. It has a couple of /inspection marks but unusally no later inspection dates. Procured for use by the AAF and USN. A very good '+' example. Stock code MW21031.